Gloria is an American sitcom and a spin-off of All in the Family that aired Sundays at 8:30 p.m. (EST) on CBS from September 26, 1982, to April 10, 1983. The series starred Sally Struthers reprising her role as Gloria Stivic, the daughter of Archie Bunker on All in the Family. The set-up of the show was that Gloria had been left with loose ends after her husband, Michael "the Meathead" Stivic (who did not appear in the new series), left her for one of his students and moved away to a commune. Gloria, to be closer to her now-widowed father, decided to move with her young son, Joey (played by Christian Jacobs), and pick up the pieces of her life as an assistant to two veterinarians in Fox Ridge, New York. The veterinarians were played by Burgess Meredith and Jo De Winter; the character played by Meredith was also, conveniently, Gloria's landlord. 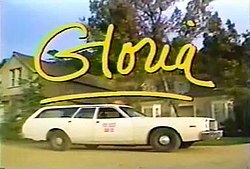 Though Gloria ranked 18th in the Nielsen ratings for the 1982–1983 season and scored an 18.7 rating, tying it with Trapper John, M.D., CBS chose not to renew it for a second season, making it one of the few spin-offs of All in the Family not to have a successful run. CBS rejected Gloria's original pilot which featured a brief cameo by Carroll O'Connor as Archie Bunker dropping off Gloria and Joey at Dr. Adams' clinic and residence. It was instead aired as a backdoor pilot episode within Archie Bunker's Place. This pilot was written by veteran All in the Family and Archie Bunker's Place writers Pat Shea and Harriett Weiss and Archie Bunker's Place producer and close Carroll O'Connor associate Joe Gannon who co-created, wrote, and produced the pilot. They were replaced by former WKRP in Cincinnati writers Steve Marshall and Dan Guntzelman (who would later find success writing and producing the long-running ABC sitcom Growing Pains). The show's production was moved from CBS Television City to Universal Studios. According to a December 1982 feature interview with Sally Struthers in TV Guide, this did not sit well with Carroll O'Connor who, with the rest of the Archie Bunker's Place production staff, was effectively shut out of the production of Gloria. (Even Norman Lear, who created All in the Family and had some hand in all of its other spin-offs, had no credited involvement in Gloria.) After this, O'Connor chose to be uninvolved in the retooled pilot and series. The characters of Dr. Jim Waynewrite and Ben the handyman were dropped when Marshall and Guntzelman's second pilot was made, which went to series. In the second pilot, Joey adopted a black dog that he named Archie after his grandfather, which O'Connor was said to be less than thrilled about according to the same 1982 TV Guide article. In the original pilot, actress Jo de Winter's character, Maggie Lawrence, was an assistant to Dr. Adams. In the second pilot and the series, Maggie Lawrence is a veterinarian and Dr. Adams' partner in the clinic. Lou Richards as Clark V. Uhley, Jr.
1 21 + Original Pilot September 26, 1982 (1982-09-26) April 10, 1983 (1983-04-10) 18 18.7 Trapper John, M.D. Gloria begins her new job at a veterinarian's clinic while adjusting to life as a single mother. Gloria Bunker-Stivic returns home to raise her son Joey on her own and works as an assistant to the absent-minded veterinarian Dr. Willard Adams. Gloria reluctantly goes on her first date since her senior prom. Gloria tries to stop Joey from fighting a bully. Gloria and Dr. Adams make a near-fatal mistake on an emergency call. Gloria cares for a piglet that makes Clark and Joey jealous. Dr. Adams is the substitute teacher as Gloria takes a test in her vet-assistant class. Maggie realizes her mistake when she refuses a lawyer's toaster oven as payment for treating his monkey. Clark tells his father he's engaged to Gloria. Gloria signs Dr. Adams up for Social Security, but the computer has declared him deceased. Joey wants Gloria to retrieve his friend's cat from the house of a woman who's said to use pets for potting soil and bake children in her oven. Joey may not have a merry Christmas if he learns his father hasn't sent him the bicycle he wants. Joey agrees to visit his father, but he isn't on the plane when it lands in California. Gloria is the victim of an armed robbery, but she's unable to recall a single detail. Maggie sees an old flame while on a "house call" to a traveling circus -- Boffo the Clown. The staff of the clinic face their mortality and confess their innermost feeling when a plague-ridden squirrel puts them in quarantine. Dr. Adams' girlfriend plans to marry someone else. Gloria is delighted with the reward she's getting for finding a recently deceased client's dog, but she soon learns the dog's role in the old lady's funeral plans. Gloria gets depressed when she receives her final divorce papers. Gloria and Clark are forced to share a room at a honeymoon hotel when their car breaks down. Gloria does a sit-in to protest the budget cuts affecting the vet-assistant class. Gloria learns that she lost her credit rating in the divorce. ^ Brooks, Tim; Marsh, Earle (2007). The Complete Directory to Prime Time Network and Cable TV Shows 1946-Present (Ninth Edition). Ballantine Books. p. 1690. ISBN 978-0-345-49773-4.